Multi-cultural firsts were the order of the day Saturday at Santa Anita. Posting their first victories at The Great Race Place were jockeys Andrea Atzeni, Jean Diaz Jr. and Shane Foley. The 27-year-old Atzeni, a native of the Mediterranean island Sardinia, won the Grade III Thunder Road Stakes for trainer Simon Callaghan on True Valour at a $25 win payoff; 18-year-old apprentice Diaz from Puerto Rico took the sixth race aboard Hero For Hire ($26) trained by Jeff Bonde; and the 30-year-old Foley, a native of Ireland, posted a $34.40 upset with John Sadler trainee Platinum Warrior in the Grade II San Marcos Stakes. “It felt so good to win here, especially this soon,” said Diaz, whose father, 41-year-old Puerto Rican riding great Juan, and mother, Amarilis, were on hand to see Jean record his landmark triumph on only his third mount here. Saturday was a first for Callaghan as well. 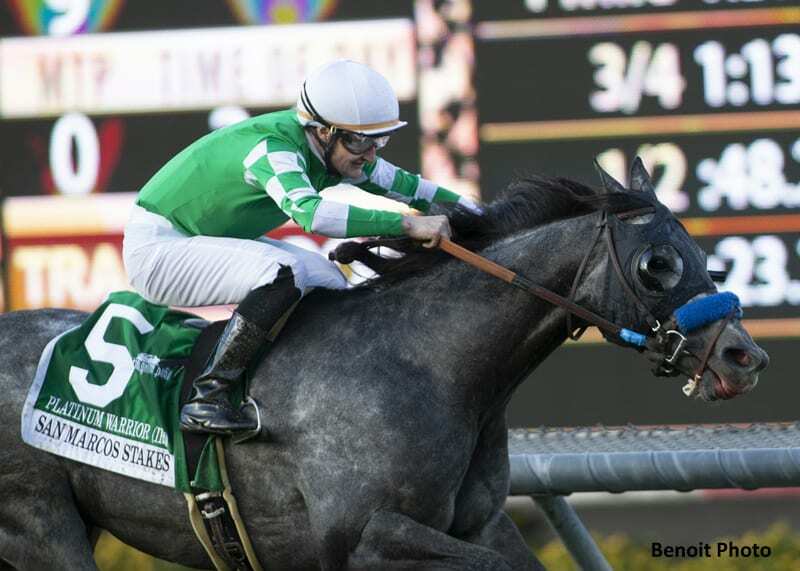 In addition to True Valour, the native of England who turns 39 on March 7, also saddled odds-on favorite Bellafina to win the Grade II Las Virgenes Stakes. “That's the first time I won two stakes on the same day,” Callaghan said. This entry was posted in People and tagged andrea atzeni, first winner, jean diaz, platinum warrior, puerto rico, santa anita, shane foley, Simon Callaghan, true valour by Ed Golden/Santa Anita. Bookmark the permalink.